This assembly of column and horizontal formatted drill worksheets have been framed specifically to enhance children's comprehension of 0 to 5 subtraction. 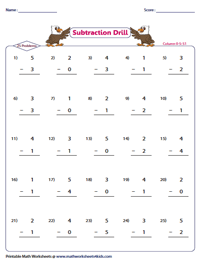 Each topic provides great practice for kids as each set contains 15 to 50 subtraction problems per worksheet. You will also find a number of free printable worksheets ready for use. Suitable for Kindergarten and grade 1 children. 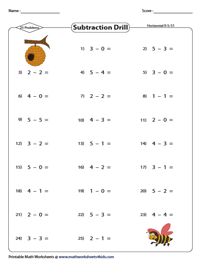 This set of column subtraction worksheets will help reinforce your child's skills in 0-5 subtraction. Use the answer key to check your responses. 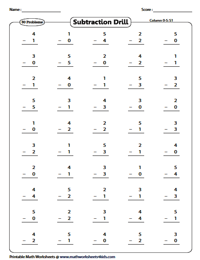 A plethora of worksheets is stacked in this page to up skill kid's knack in subtraction. 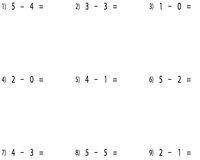 Subtract numbers from 0 to 5 which are arranged in the horizontal format. Make use of the download option to access the entire set of worksheets. Unique set of drills based on column subtraction is compiled to furnish ample practice for learners. Each worksheet contains 25 problems. 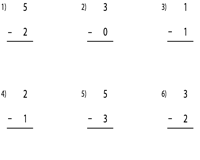 Get an ample practice in 0-5 subtraction with these drills that feature 25 problems per page. The problems are positioned in the horizontal format. An array of high-quality worksheets arranged in the vertical form will aid kids to build the accuracy and speed in solving 0 to 5 subtraction. 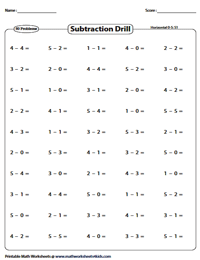 Uplift your child's confidence with these horizontal worksheets that contain 50 subtraction problems per page. Free worksheet is included.